on foot or with a short car trip. Suited for business trips but also for a highly enjoyable city break. Located about 2 km from the historic center of Cagliari, the T Hotel is a few steps from the Opera House and from the shopping streets. Its location is strategic, in a central area with many services, 5 km away from the Poetto, the beach town that boasts a 7 km coastline. Cagliari airport is about 10 km from the hotel. 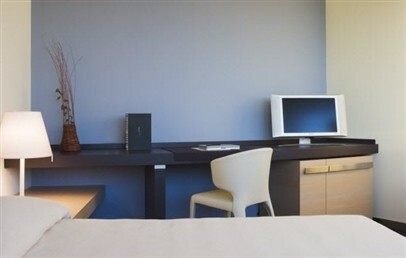 Modern, comfortable and classy: this is the T Hotel. 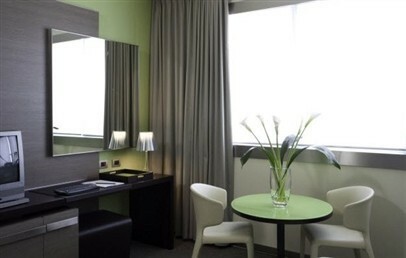 The 4-star superior hotel combines the best of urban hotels, practical and comfortable for business travellers, with dedicated services for leisure guests, in a city that is rediscovering its tourist vocation. 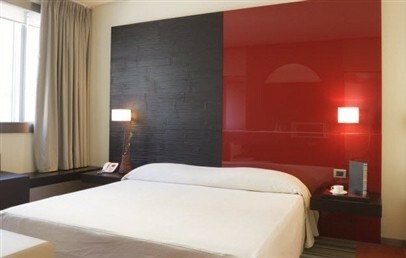 The 207 rooms at the T Hotel are decorated in a tasteful, elegant style, with a modern touch. They are divided into different areas of the hotel: those of the central body reach up to the 14th floor, offering views of the harbor, on the roofs of the city or the sea. In some rooms it is possible to add a third bed (smaller size as normal single bed). Classic, 18 sqm, bathroom with shower or bathtub. View over the park, the city or the courtyard. Deluxe, 23 sqm, bathroom with shower or bathtub. View over the park, the city or the courtyard. 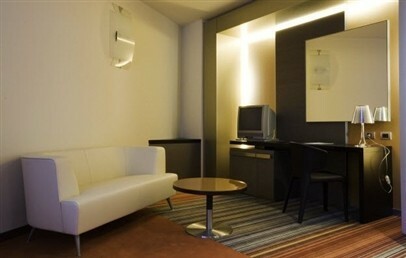 Junior Suite, 27 sqm, bathroom with bathtub or shower, some with panoramic view. Free entrance to the TSpa (90’ hydromassage, Turkish bath and emotional showers), subject to availability and upon reservation. Suite, 42 sqm, some are Duplex and some with separate living room. Free entrance to the TSpa (90’ hydromassage, Turkish bath and emotional showers) subject to availability and upon reservation. The hotel has some rooms for allergy sufferers as weel as disabled access rooms. The town beach, the Poetto, is just a few km from the T Hotel. The long coastline is characterized by fine sand and shallow water suitable for children. During the winter it is a favorite destination for joggers and walkers on the seafront, while livening up the summer with events and live concerts. The temple of relaxation is downstairs: the exclusive T Spa center, which its exclusive line products and treatments Comfort Zone, offers countless rejuvenating treatments and massages. Acqua Journey, hydromassage tub, chromotherapy and aromatherapy showers, beauty treatments and massages; an herbal tea room and a fully equipped fitness center complement the rich offer for the psychophysical well-being. Please Note: The Acqua Journey treatment is included for all guests of Junior Suites and Suites while an extra charge is required for guests of Classic and Deluxe rooms. The Spa entrance for guests under 18 years is allowed only from 09.30 to 11.00 a.m. The fitness room is available for free for all hotel guests. The traditional flavors with a hint innovative: this is what guests will find at T bistro for lunch and T Restaurant for dinner, where they can also enjoy a rich and tasty breakfast buffet. In the informal and friendly atmosphere of the T Bar, guests can relax with a coffee and fine pastries, or enjoy a drink at the end of the day. The hotel has a dynamic, contemporary spirit: it houses temporary exhibitions creating a continuum between art of hospitality and creative innovations; it is always open to new challenges and new trends. The internet service is free of charge (wireless in the lobby, cable internet in the rooms). 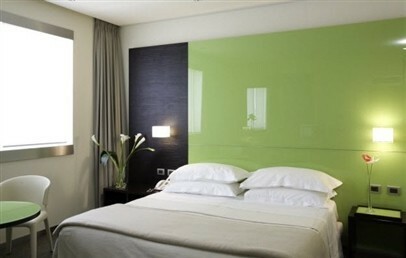 The T Hotel is entirely non-smoking, apart from the terrace “Il Giardino d’Inverno”, and does not allow pets. Free parking for hotel guests. 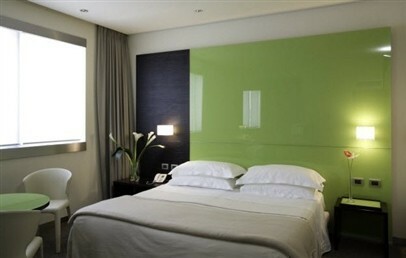 Spacious modern rooms, with elegant and essential lines. Bathroom with elegant mosaics, bathtub or shower, slippers and complimentary toiletries. Complimentary Wi-Fi internet connection. View over the city or the park. 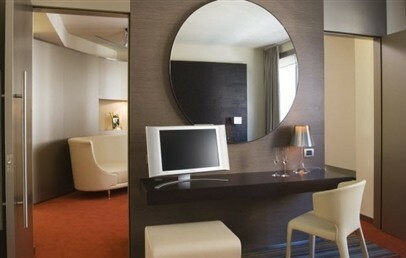 Spacious modern rooms, with elegant and essential lines, with living corner, some with parquet. Bathroom with elegant mosaics, bathtub or shower, slippers and complimentary toiletries. Complimentary Wi-Fi internet connection. View over the city, the sea or the courtyard. 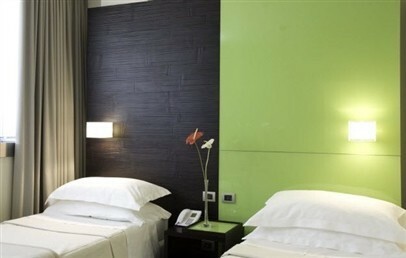 Spacious modern rooms, with elegant and essential lines. 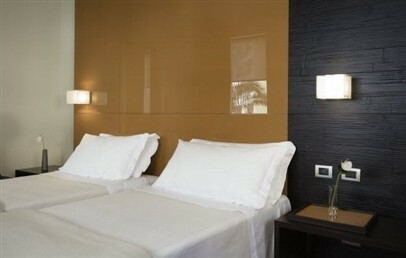 Bathroom with elegant mosaics, bathtub or shower, bathrobe and slippers, complimentary toiletries. Complimentary Wi-Fi internet connection. View over the city or the courtyard. Complimentary entrance to the Spa (reservation required). 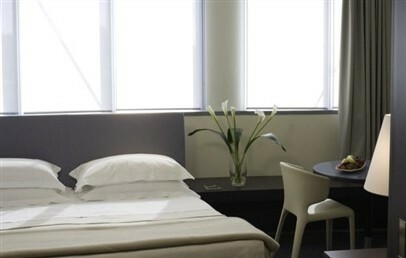 Spacious modern rooms, with elegant and essential lines. Some are duplex, others are on one floor and have a separate living room. 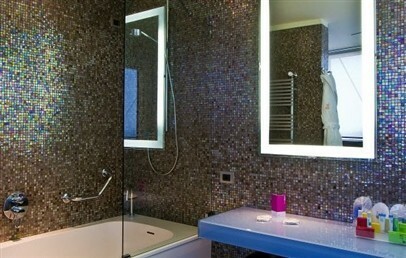 Bathroom with elegant mosaics, bathtub or shower, bathrobe and slippers, complimentary toiletries. View over the city or the courtyard. Complimentary Wi-Fi internet connection. Complimentary entrance to the Spa (reservation required).